Integrative medicine strives to address all aspects of a person’s health by considering more than just the physiological symptoms. 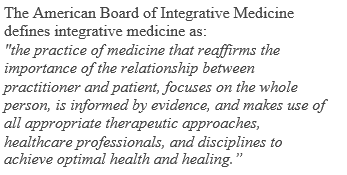 According to physician Dr. Andrew Weil, one of the defining principles of Integrative Medicine is “the consideration of all factors that influence health, wellness, disease – including mind, body and spirit.” As such, integrative medicine practitioners incorporate treatments that are more holistic and include research-based practices such as mindfulness. Visit www.curtwoolford.com for more information about mindfulness and mindfulness coaching. 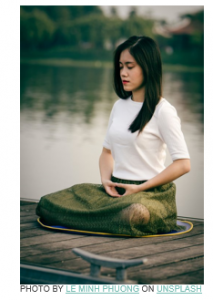 Get the support you need to benefit from a mindful life. Schedule your mindfulness coaching session today: http://www.curtwoolford.com/mindfulness-coaching/. Curt’s professional background includes mindfulness, organizational development, organizational communication, and human resource development. 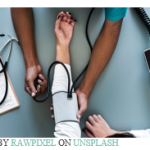 He is founder and director of the Mindfulness program for Crozer-Keystone Health System where he teaches mindfulness-based stress reduction and develops workshops for physicians and nurses. 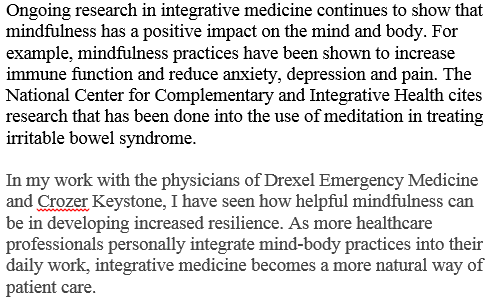 Curt’s mindfulness at work consulting includes Drexel Emergency Medicine, Lourdes Health System, Crozer Chester Medical Center, Independence Blue Cross, Drexel Law School, Philadelphia Bar Association, Subaru of America, Swarthmore College, and Penn State University. Curt has been a practitioner of mindfulness for 30 years. He has studied mindfulness-based stress reduction with Jon Kabat-Zinn, The Penn Program for Mindfulness, and the Jefferson Mindfulness Institute. Curt has been an instructor of mindfulness, yoga, tai chi, and qigong for 20 years. With degrees in Philosophy and Educational Psychology, Curt brings a deep awareness of the learning process to his mindfulness instruction.